B.N.College, Dhubri Recruitment 2018- Assistant Professor in Botany: Bhola Nath College, Dhubri Recruitment 2018. Applications in Model Application Form (available in DHE website www.dheassam.gov.in/ circulars) along with all supporting documents are invited for the post of Assistant Professor in Botany as per UGC norms with NET/SLET/ SET as mandatory eligibility conditions. Eligibility: Candidates having Ph.D. Degree in accordance with the UGC (minimum standard and procedure for award of Ph.D. Degree) regulation 2009/2016 whichever in force at the time of registration shall be exempted from NET/SLET/SET. The candidate must know the local language. The candidate must acquire 55% marks with relaxation of 5% for SC/ST/differently abled candidates and Ph.D. Degree holders, who have obtained their Masters Degree prior to September 19, 1991. Age limit: Age of the candidate should not be more than 43 years (with relaxation of 5 years for SC/ST/differently abled candidates) as on 01.01.2018. Application complete in all respects including Contact No. & Email ID must reach the Principal, B.N.College, Dhubri, P.O. Bidyapara, Dist. 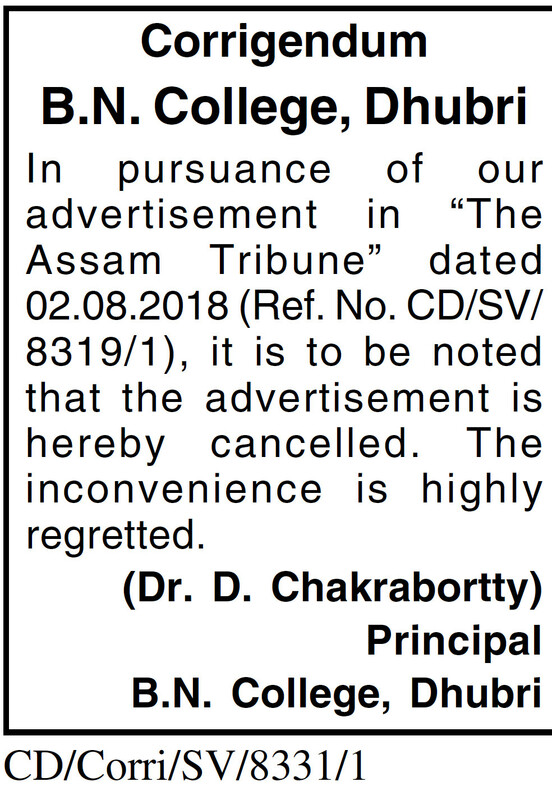 Dhubri (Assam), Pin – 783324 within 20.08.2018 up to 4.00 P.M. No application will be entertained after the time and date mentioned above. Eligibility like M.Phil./ Ph.D./Seminar Papers/ Publications can be acquired and submitted on the date of interview but not beyond. In service candidates must apply through proper channel with NOC obtained from the concerned authority.